Hey, hipsters! So that 1980s calculator wristwatch you’re wearing isn’t retro enough for you anymore? 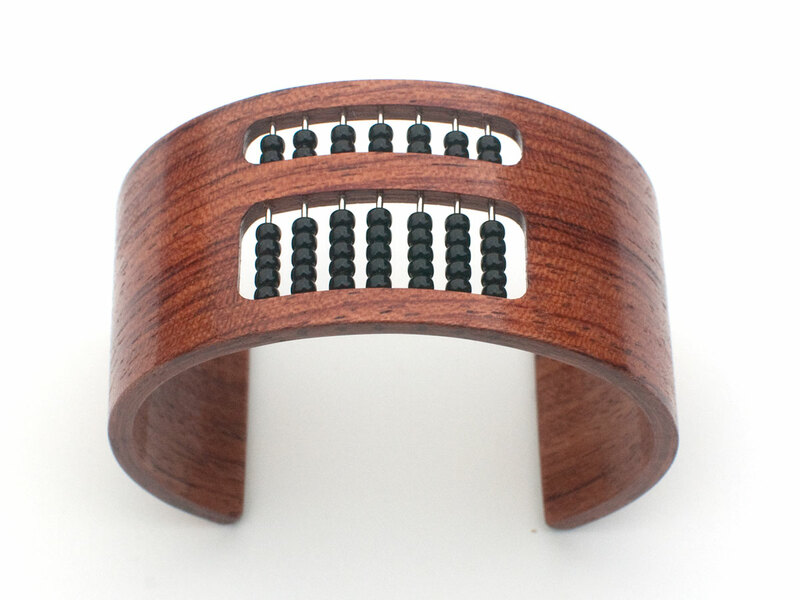 Time to go waaaaay back in time with your wrist-worn calculating devices, all the way to the abacus. 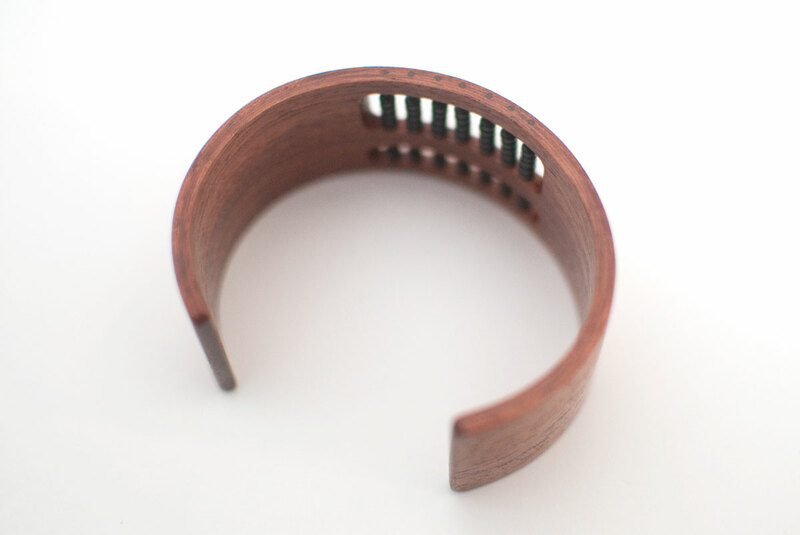 The bracelet is made from layers of bubinga veneer, glued around a form one layer at a time. Individually, each piece of wood is flexible, but when they’re glued together they hold their shape. 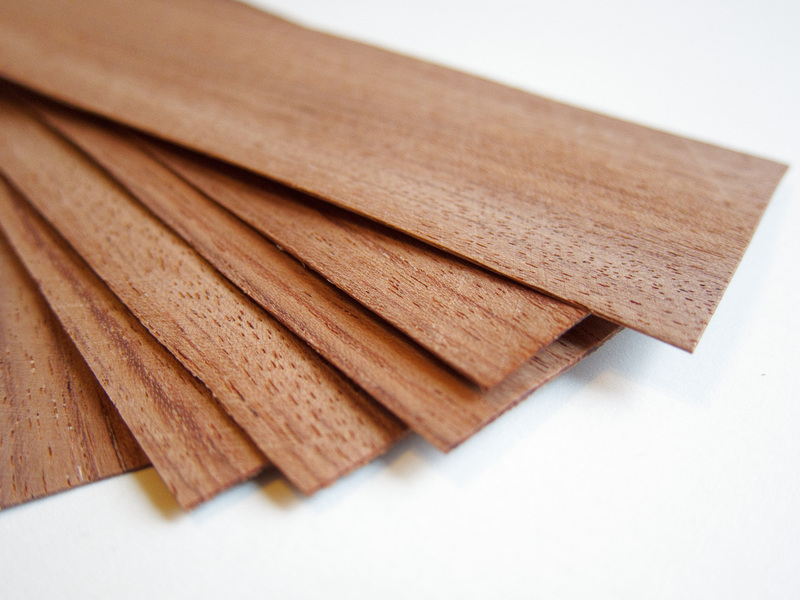 Below are veneer sheets cut into 1.5″ wide strips for the bracelet. 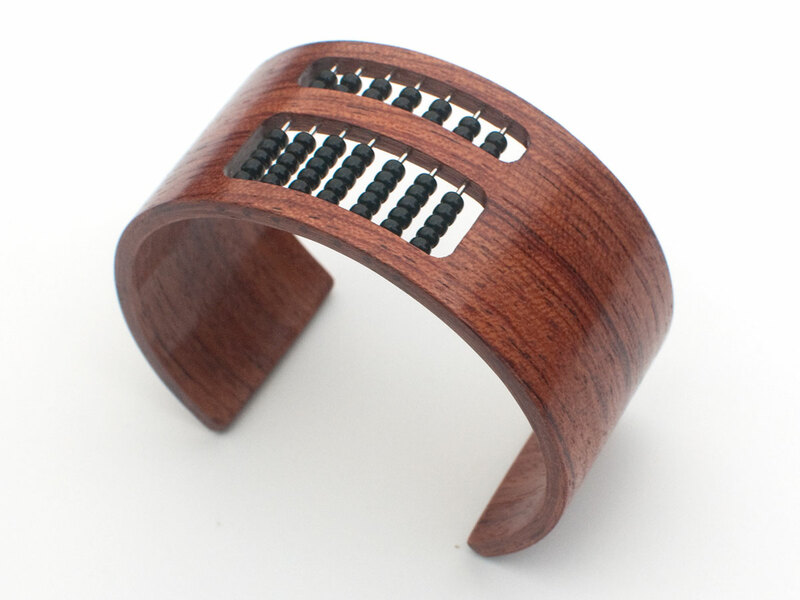 The first step was to make a form for the bracelet. I drew out the shape in Illustrator, printed it, then spray-mounted it to a scrap of 2×4. I cut around the edges with the band saw, then smoothed it right up to the line with the belt sander. 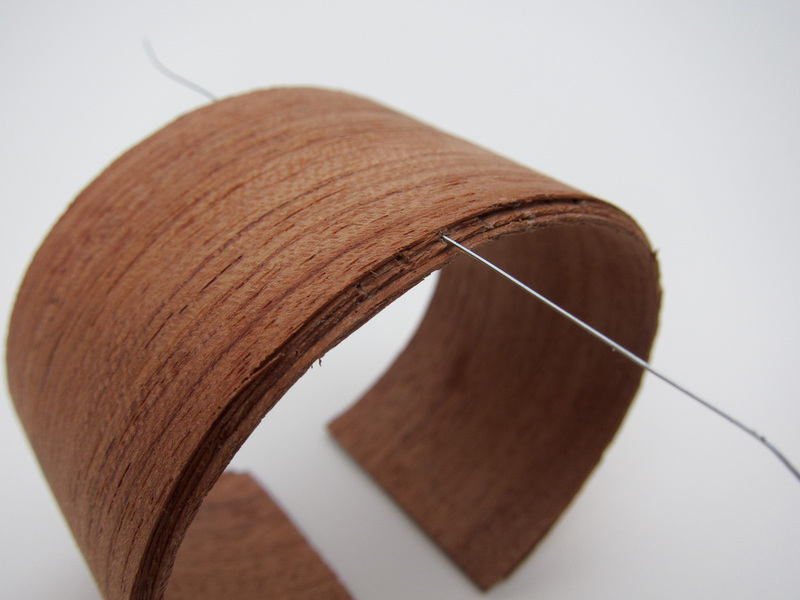 To make the bracelet I spread some glue on a strip of veneer, wrapped it around the form with the glue side out, then wrapped another strip around it. Hose clamps held its shape until it dried, then I added another layer, let it dry, added another, and so on until seven layers were built up. My first attempt (this project wasn’t successful until the third try) had indentations in the wood from the clamps, so on later attempts I put a layer of brass sheet around the wood to spread the pressure of the clamps. 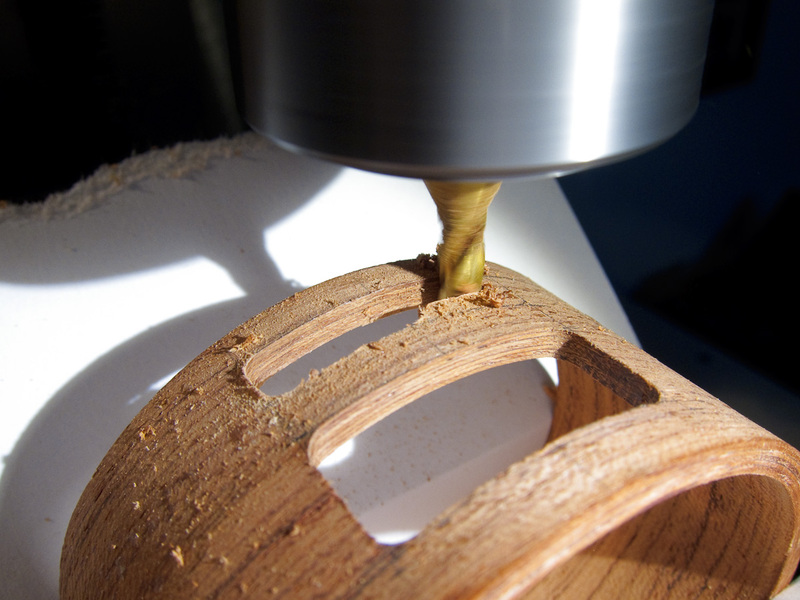 A scrap of baking parchment keeps any glue squeezed out from sticking to the clamps. 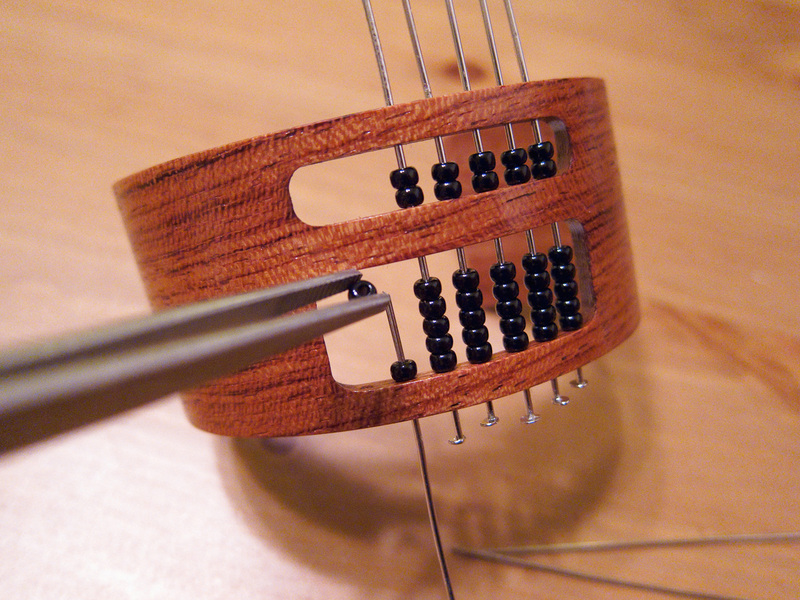 Once I had all 7 layers finished I drilled holes through the wood for the rods that the beads would slide on. Unfortunately, because of the bit’s small size, the characteristics of the wood, and some poor alignment on my part, the perfectly spaced and centered holes on one side wandered all over on the other side. On my second attempt I tried to be more careful in alignment. It was slightly better than the first attempt, but still not good enough. For my third try I realized I could make some channels for the rod before I glued on later layers. These would serve as pilot holes when I drilled. 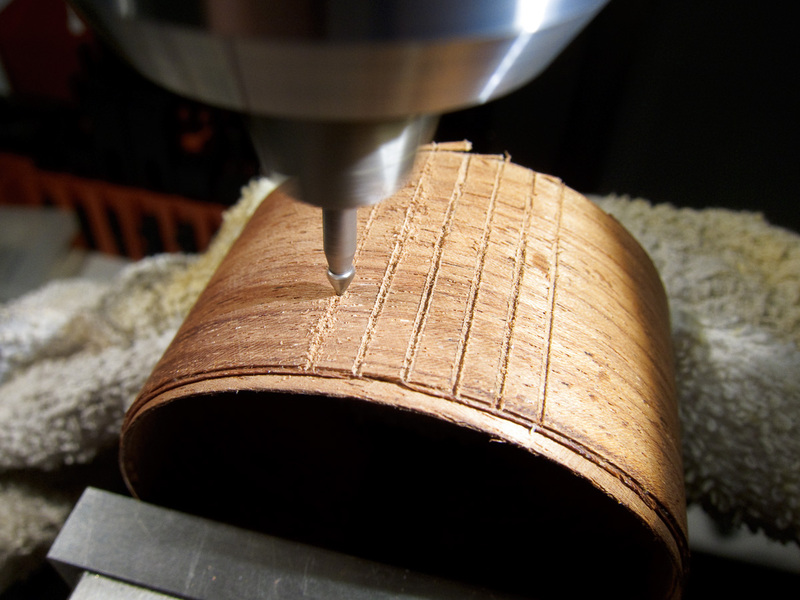 I stopped at the 4th layer of wood and clamped it into my milling machine, then ran an engraving bit across the layer (as seen in the photo below). This ensured that the channels were straight and evenly spaced. When I glued on the last three layers I had to take care that glue didn’t block the channels, so as it dried I passed a piece of guitar string back and forth through each channel to keep it clear. 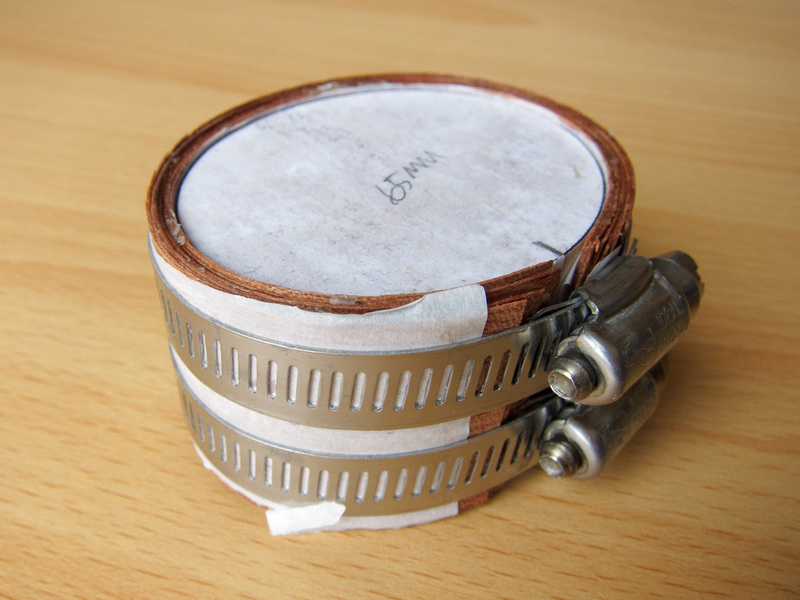 The photo below shows this, but without the clamps and the form. 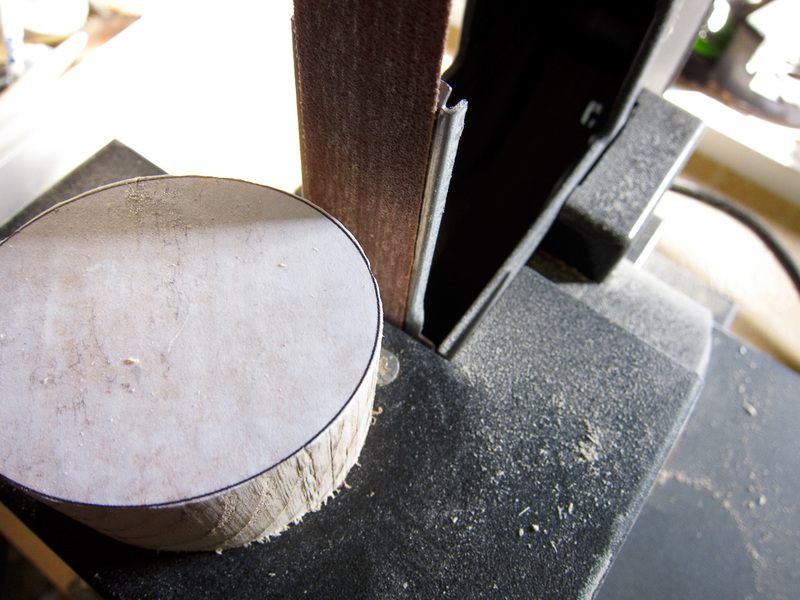 Once all the layers were formed and dried, I squared the edges on the belt sander and clamped it into the mill again. This time I routed out the openings where the beads would go. 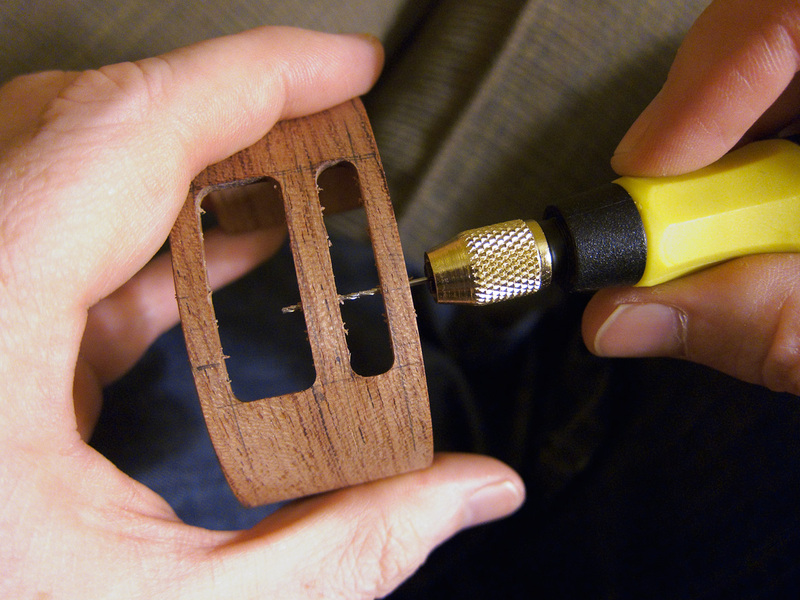 The photo below shows this step on an early attempt, without the pilot holes/channels in the middle. With everything roughed in, I drilled the pilot holes to size. It worked perfectly—the holes were just as aligned on one side as on the other. 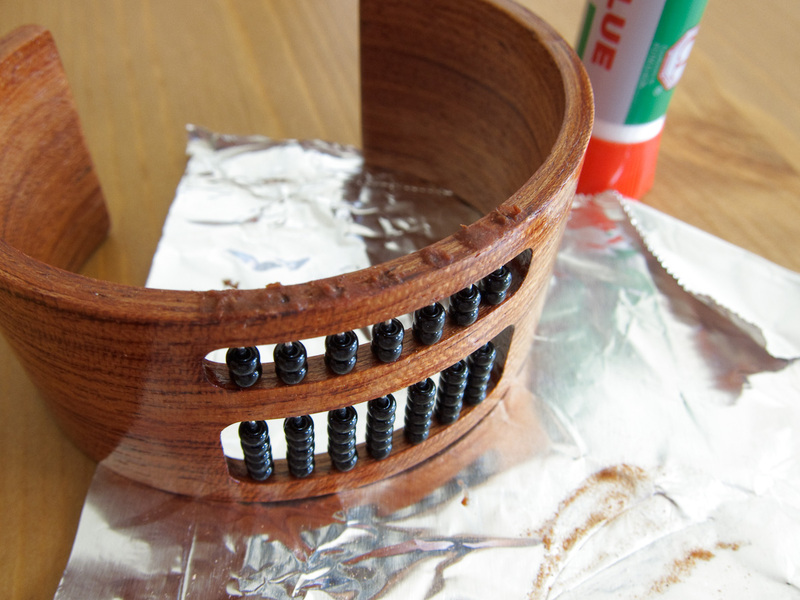 After sanding and applying a finish, I pushed the wires through and threaded the beads. I cut each wire shorter than the width of the bracelet so that it would be inset in the holes, then filled the holes with a paste made from super glue and sawdust from the bracelet (for matching color). When that was dry I sanded down the excess so it only remained in the holes, smoothed it, and applied more finish to the edges. Here you can see the edge where the holes were. They’re still visible, but don’t jump out at you. And here it is, finished and ready for all your on-the-go calculation needs!